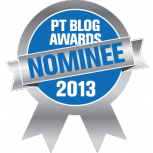 Kettlebell Therapy™: Kettlebell Therapy nominated "Best Use of Social Media"! Kettlebell Therapy nominated "Best Use of Social Media"! Wow! I want to thank you all so much for this!! When I received the e-mail from Therapydia, it actually came as a complete surprise. The Kettlebell Therapy blog has been nominated in the "Best Use of Social Media" category of the PT Blog Awards sponsored by Therapydia!! Thank you all so much! I'd love for your support in voting for this blog! Best of luck to all the candidates in all categories! !